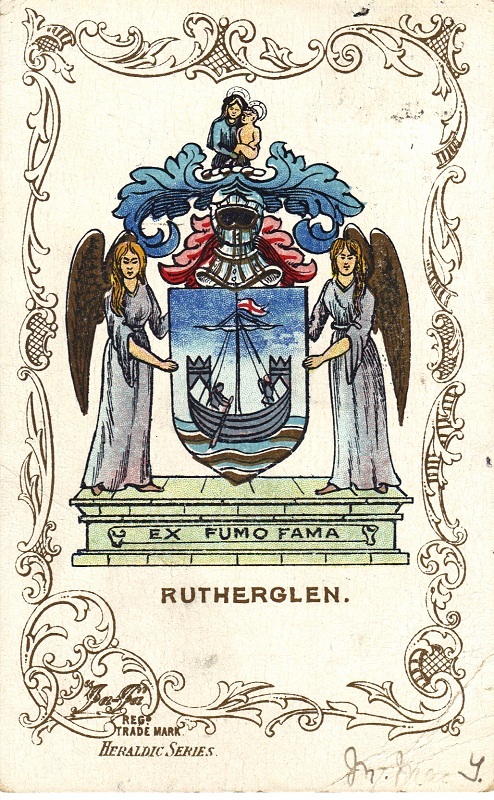 Rutherglen Coat of Arms. The Motto, Ex Fumo Fama apparently translates as Fame from Smoke. Main Street. The old style belisha beacons at the Zebra Crossing. Not sure about the cars though. Possibly a Morris or Austin on the left and maybe a Riley on the right. Open for suggestions. 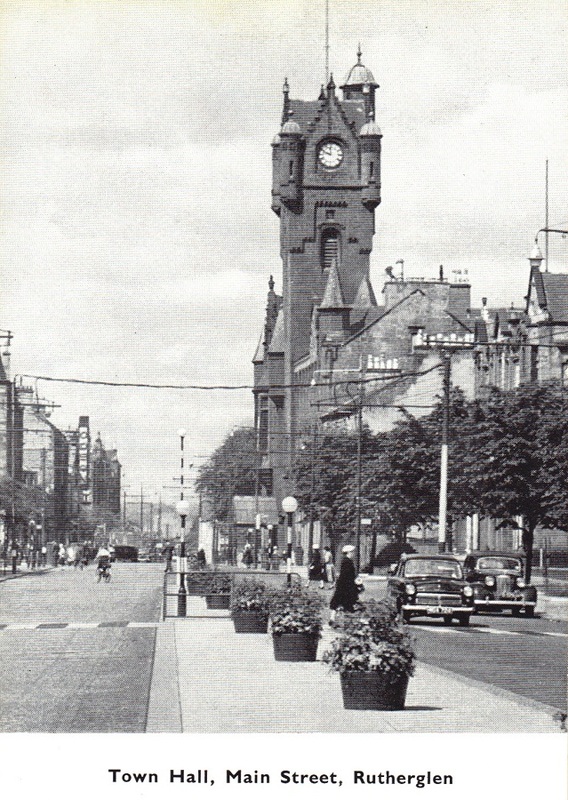 An earlier shot of the Main Street and Town Hall when the mode of transport was maybe more environmentally friendly. 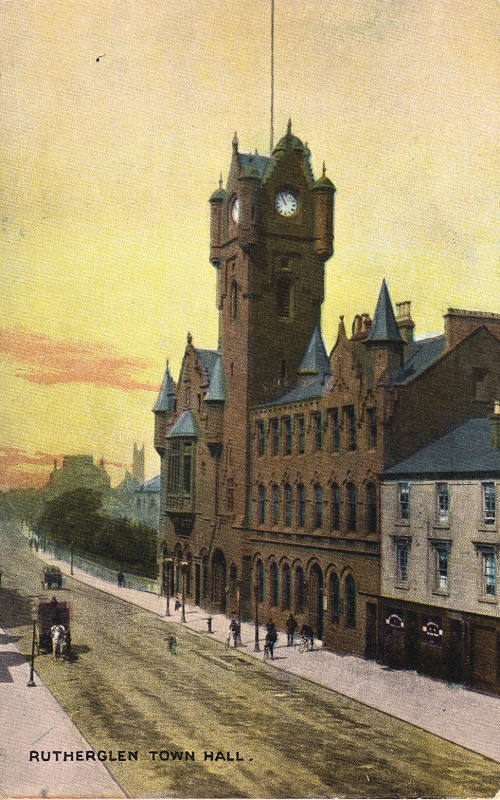 The Town Hall dates from 1862. A bit harder to date this shot. 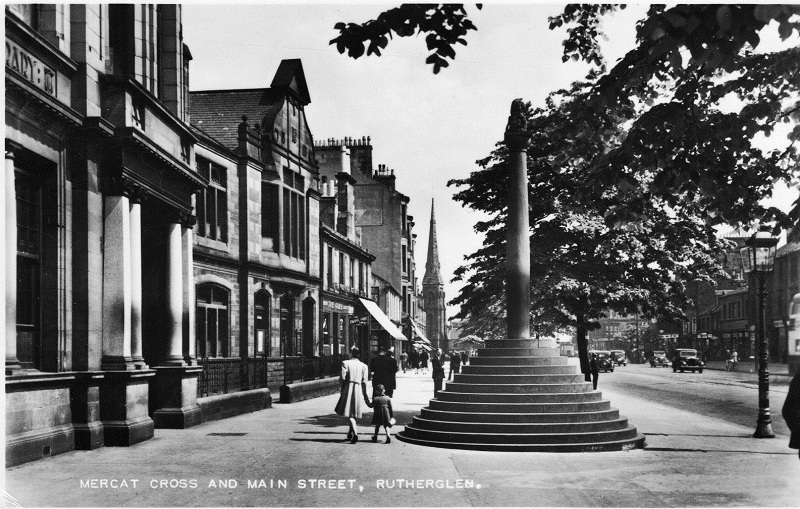 The Mercat Cross in front of the library in Main Strret, Rutherglen. It was unveiled by Lord Fleming on 25 June 1926. 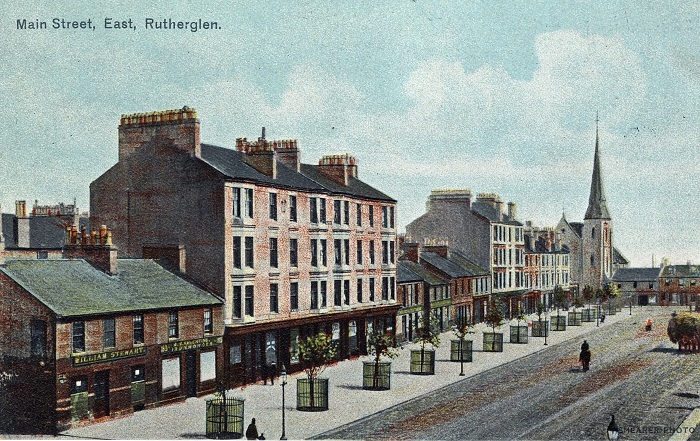 Main Street East, Rutherglen. 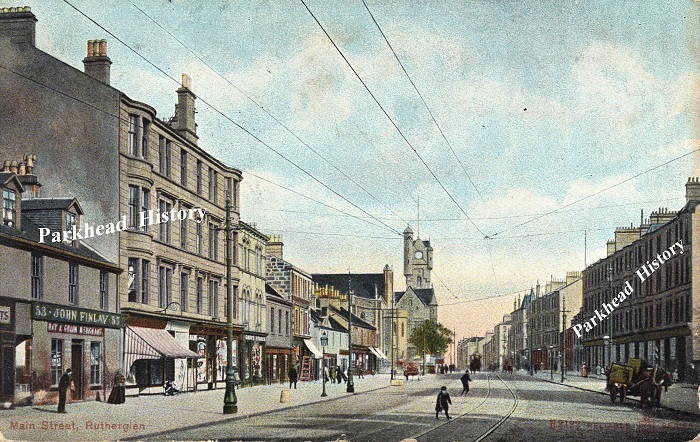 The first shop on the left is William Stewart with J W Valentine, Ironmonger next door at number 183. 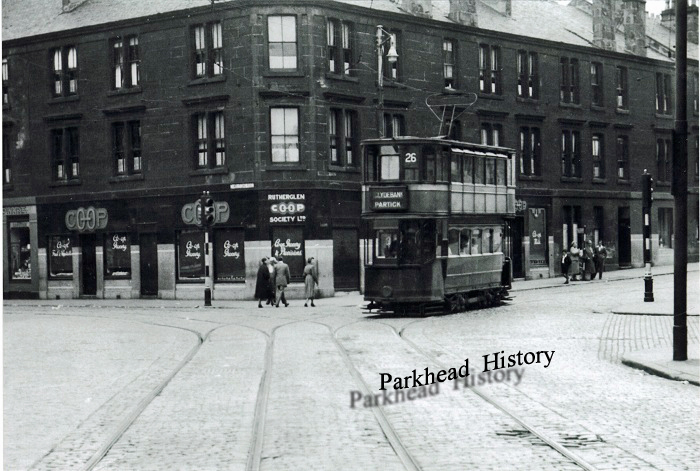 A Standard Tram, number 26 service exiting from Farmeloan Road into Dalmarnock Road with Rutherglen Co-Op on the corner. Main Street August 1953. 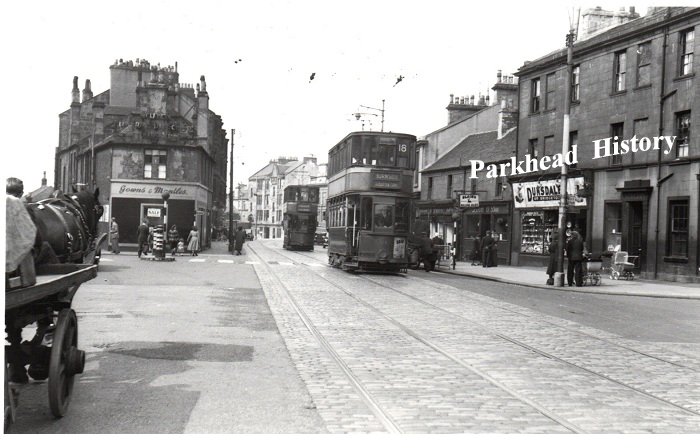 On the right hand side is the pub Linn O’ Dee and Dunsdale of Bridgeton store. EDITH CHESHIRE. Does anyone remember me ? 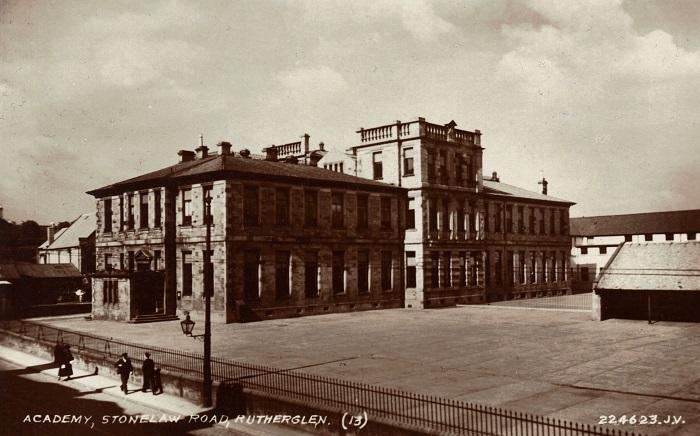 I went to Rutherglen Academy in 1967 and left before third year as we moved to Dalmarnock Road and then I went to Riverside Secondary. I was in 1A and then 2B and my friends were Anna Banks and Roma Chambers. Changed my name to Lilli since then. Married twice and lived in Australia for a while, had an Aussie partner but moved back to the UK 6 years ago. Living in Exeter now. I found some interesting graves in the churchyard … some I photographed then looked up what I could about them.. 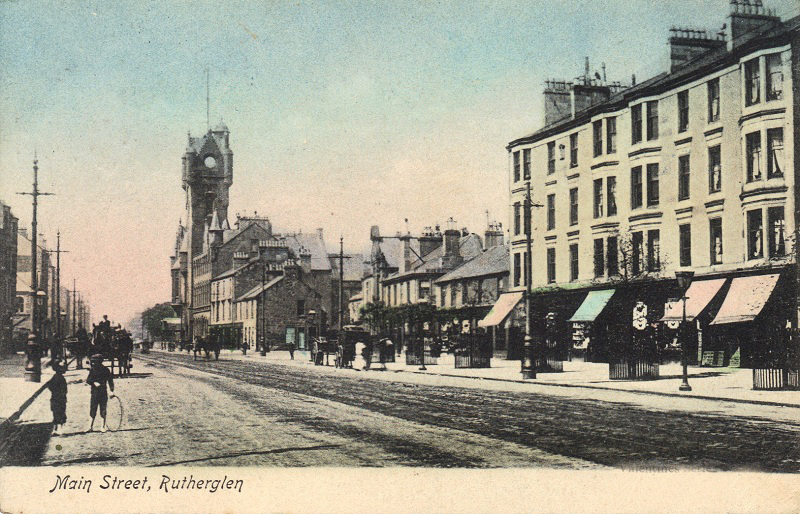 I must look them out as one man had left for Australia and had given the name Rutherglen to the town .. He is either buried in Rutherglen or the stone is a memorial one to him… Ill try and find the photos and information on him. I’ve looked at both your suggestions about the car makes and I think you could be spot on with both. Well done and thanks for visiting the site. I hope you keep on enjoying it. 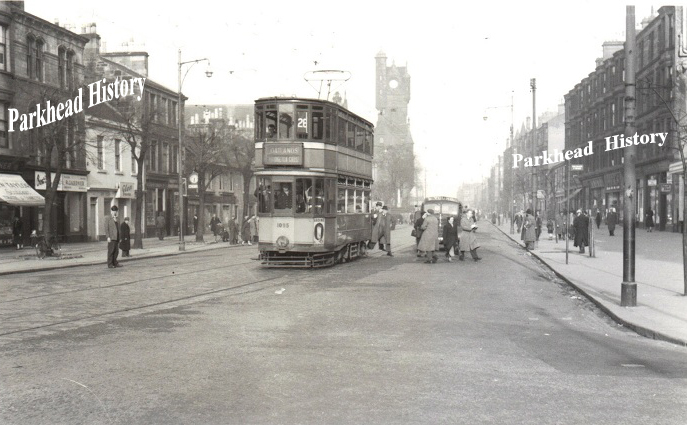 Hi there I believe the car on the left of the above picture is a 1950s Ford Consul, no sure of the other though. good pictures many thanks for posting them.